Friendly homely atmosphere will greet visitors to the 23 guest room Albergaria located within the city walls. The Inn has been converted from 16th century olive mill with an attractive garden area. Discount rates online. 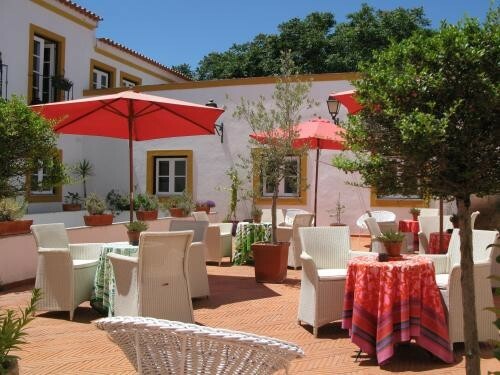 The Albergaria do Calvário Inn was originally a olive oil mill for the 16th century neighboring Convent and remains of its historical past remains today. Évora has been classed a World Heritage Site by UNESCO and the Albergaria do Calvário is a reflection of this architectural accolade. The hotel is located within the city walls and offers just 23 guest rooms all equipped with modern facilities and marble bathrooms. Rooms are simply yet comfortably designed with a minimalist ambience. Guests can enjoy a delightful hotel breakfast made using organic or locally-grown products. The garden esplanade is the perfect venue to enjoy a glass of Portuguese wine and to soak up the atmosphere.